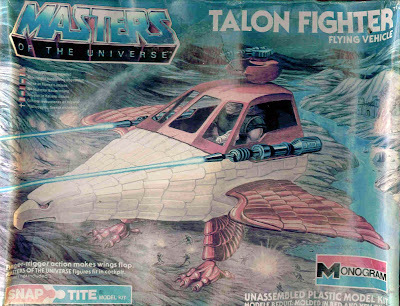 From the legend on the box: "This sleek, bird-like craft transports MASTERS OF THE UNIVERSE forces through the skies in their ceaseless quest for victory. The excitement of fantasy is captured in model kit form in this unique air-attack vehicle..."
The kit has a wingspan of 32.7 centiments, and is intricately detailed "from the thrusting eagle's head to the claw-like landing gear. It includes top-mounted gun turret, side-mounted laser cannons and a canopy that opens for easy access to the contoured cockpit." Wow....so the idea is you build a model of a toy that looks exactly the same? Guess the double dip isn't new! Actually the model kit is much sleeker and more detailed looking.